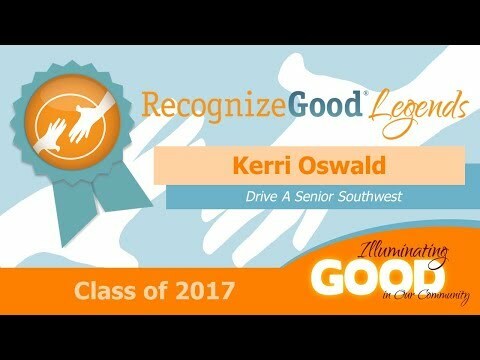 For over 14 years, Kerri Oswald has given her time and dedication to Austin’s senior community, helping sharpen their minds and personally putting in over 3,200 hours to ensure their safe transportation. I was in awe of the company I was in. So much goodness in this broken world. What a wonderful organization RecognizeGood is! In 2003, Kerri Oswald began volunteering with AGE of Central Texas to help adults with early memory loss. The Memory Connections program is one of the nonprofit’s most successful initiatives, helping people experiencing symptoms of early-stage dementia with cognitively engaging activities ranging from discussions on current events to creative writing and music therapy. In the 14 years since the program launched, Kerri has dedicated every Friday morning of her life to helping lead the program participants in these activities. Additionally, through that volunteer connection, Kerri discovered the transportation frustrations of the seniors she worked with – simply getting from place to place for these seniors could be complicated, expensive and sometimes even impossible. Kerri dug into the problem and before long, became a founding director of Drive A Senior Southwest. Drive A Senior has five chapters serving Central Texas, and does just what the name implies – allows seniors who no longer drive to “age in place” and live independently by offering free rides for groceries, doctor’s appointments, or just about anything else. Kerri saw her chapter grow from 228 rides in its first full year to just under 5,000 rides in 2017.